News of this model (owned by Tom Platt) came via an article in The Black Country Bugle dated 25th October 2012. 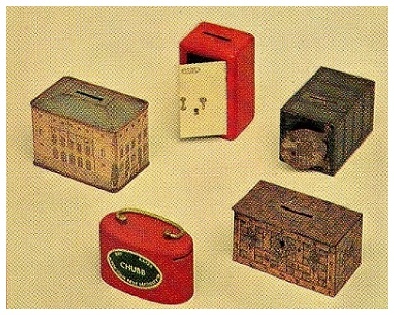 Four of the boxes pictured left were issued in 1926; the sales brochure described them all as being “well finished and suitable as Christmas or Birthday gifts for use as a Children’s Savings Bank”. The box with circular door commemorated the British Empire Exhibition in 1924. The red oval box was a later addition to the range. Top left was a replica of Queen Mary’s Dolls’ House. And measures 4½ x 2½ x 3½ inches. 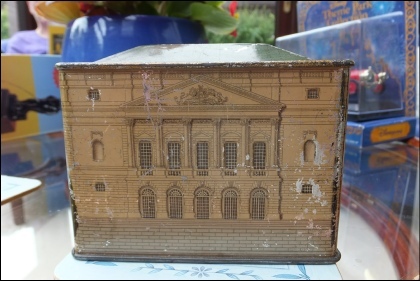 The actual Dolls’ House is amongst many items in The Royal Collection Trust at Windsor Castle (Click here) for details.